To me, Eddie and the Cruisers has always seemed like a missed opportunity. The premise is pregnant with possibilities: an investigative reporter (Ellen Barkin), eager to capitalize on the resurgence of a defunct rock band, decides to look into the supposed death of the lead singer. 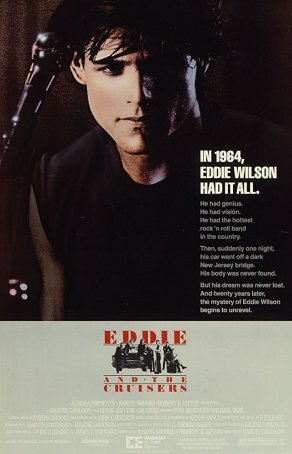 Did Eddie Wilson (Michael Paré) really die in a 1963 automobile accident? No body was found, after all. Or did he fake his own death as a way of fading from the limelight? Drawing on real-life conspiracy theories that have surrounded the untimely demises of popular music stars from Elvis to Prince, Eddie and the Cruisers asks this fascinating “What if?” question. Unfortunately, the answers it comes up with are less than compelling. The film can be divided into two pieces. In the current timeframe, which is the year when the movie was made (1983), everyone who was once in Eddie’s orbit has moved on. We catch up with them as Barkin’s Maggie Foley tracks them down. The backstory, which chronicles the time from the band’s rise to Eddie’s “death”, takes us back two decades. In terms of narrative thrust, the segments from the 1960s work considerably better than those in the 1980s. Although there’s a generic aspect to The Cruisers’ arc, there are some nice touches. The “current” portion, however, is trite with hard-to-swallow character evolutions and a “mystery” that is neither compelling nor satisfying in its resolution. The movie is (mostly) presented from the perspective of “Wordman” Frank Ridgeway (Tom Berenger), a lyricist who joins the group while it’s still playing clubs on the Jersey Shore (the Springsteen allusions come fast and frequently). Before Frank’s admission, the Cruisers are comprised of five members: front-man Eddie; his main squeeze, backup singer Joann Carlino (Helen Schneider); bassist Sal Amato (Matthew Laurance); saxophonist Wendell Newton (Michael “Tunes” Antunes); and drummer Kenny Hopkins (David Wilson). Also hanging around is their manager, Doc Robbins (Joe Pantoliano). Following the success of the Spingsteen-esque song, “On the Dark Side” (a tune that sounds exactly like something the Boss might have done, albeit ten years prior to the earliest date when he would have done it), The Cruisers hit the big time, and that’s when the problems begin. Sal and Eddie feud, Wendell dies of a drug overdose, and the growing attraction between Frank and Joann threaten the fabric of the band. Then comes the fateful night when Eddie’s car goes into the water. Of course, Eddie isn’t really dead, although we don’t learn that until the final scene and the characters never figure it out. The title character’s resurrection is intended as a surprise but it’s anything but that. (Sort of like bringing back Spock in a movie called The Search for Spock wouldn’t be a shocker.) It feels more like a cheap gimmick than anything else, although it paved the way for the 1989 sequel, Eddie and the Cruisers II: Eddie Lives! Although Michael Paré’s dramatic performance leaves something to be desired, he captures the intensity and charisma of a rock singer and combines it with a near-perfect “look.” The only time Eddie and the Crusiers shines is when the band is playing, which unfortunately represents a distinct minority of the running time. Tom Berenger doesn’t embarrass himself, which is more than can be said for many of the other actors, whose performances range from the lower end of mediocre to high school stage play-bad. Ellen Barkin subsequently admitted that she thought the script was terrible but was convinced to do the movie by an agent who argued it was too much money to pass up. Although the movie gets the ‘80s right (one would hope this would be the case since that’s when it was filmed), it mostly botches the ‘60s, at least insofar as the music is concerned. Pretty much every song played by The Cruisers sounds like it was written in the 1980s. The argument is that the group was “ahead of its time” but that seems like a lazy way of saying that the filmmakers were incapable of crafting era-appropriate music. “In the Dark Side” got radio airplay, making it all the way to #7 on the Billboard Hot 100. Like another early 1980s relic, Xanadu, Eddie and the Cruisers boasted better record sales than ticket sales. The film isn’t completely without merit. As previously mentioned, the music sequences are well-made and there’s an energy evident when The Cruisers are playing that’s absent from the rest of the production. Some of the material about conspiracy theories and Sal’s resurrected band echo real-life aspects of the music business. But most of the other stuff is bad soap opera and the resolution of a mystery about who’s pretending to be Eddie in 1983 is cheesy and doesn’t make a lot of sense. Whatever goodwill the movie builds up during its first 85 minutes is thrown away in the idiotic, anticlimactic final ten.